I know what you’re thinking. I have to admit that, at first, I thought the same thing: “A concept album about the Bible? Constructed like a radio show? With puppets? For kids? That’s never going to fly!” And yet somehow Colin Buchanan has done it. Fam! Bam! Bible Jam! is Colin’s 24th album of Christian songs for children. Over the course of 71 minutes, Colin and his co-host/puppet pal Nudge explore the importance of God’s word, sing their way through various songs, and engage in some lighthearted banter. The radio format comes complete with traffic report, weather report, interviews with Bible teachers, and ads from the program’s “sponsors” (the ads were among my favourite parts of the album). I found the concept surprisingly effective, and it made me wish Colin had a regular family devotional podcast that I could listen to with my kids. Woven through the entire program are tremendously fun songs about God’s word – new gems as well as old favourites. The titular track reminds us that “God’s word will light your path/God’s word will show the way”. The hard rocking “Hold it Up to the Bible” encourages us to “let God’s word be your guide”. As usual, the songs vary in musical style, from Colin’s more familiar country leanings to theremin-led tango in “The B-I-B-L-E”, marching band in “Here Comes God’s Word” and electronica/dubstep in “The Horsey Dance (Open Your Ears to God’s Word)”. Depending on your sensibilities, you may prefer certain songs over others. But all are characterised by Colin’s simple yet Christ-focused lyrics that joyfully urge you to look to the things of God. That said, the thing that makes the whole package shine is Colin’s championing of Fam! Bam! 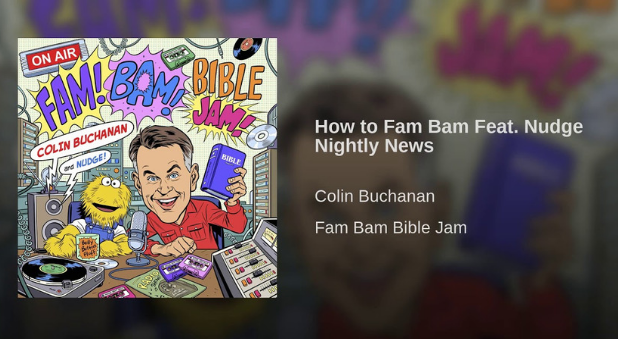 Bible Jams – that is, family devotions. This is outlined in Track 23, when Nudge asks, “What if mums or dads or kids want to have their own Fam! Bam! Bible Jam! together? How do they do that?” Colin replies with some simple instructions – “Number 1: Read a little bit of the Bible together… Number 2: Maybe have a little talk about what you’ve read… [and] Number 3: Then you can pray (that’s talking to God)” – then he and Nudge also put these instructions into practice, demonstrating how families can have a “Bible jam” of their own. The more we have listened to this album as a family, the more I have come to grasp Colin’s deep passion for families like mine to know and love the word of God – and therefore know and love the Lord. In the final song of the CD (“Press On Mums”), he encourages not just mums, but dads and kids as well, to persevere in the faith: “Look towards your Jesus and press on”. Fam! Bam! Bible Jam! is, I think, a tremendous gift to the Christian community, and one I am sure we will be listening to often in the years to come. I never knew I needed a Bible concept album! Maybe you do, too. Just don’t be surprised if you find your kids walking around saying they’d like to “eat a Bible teacher”!